(CAMBRIDGE, Massachusetts) — A team of scientists from the Wyss Institute for Biologically Inspired Engineering at Harvard University and from Harvard’s School of Engineering and Applied Sciences (SEAS) received a 2013 R&D 100 Award from R&D Magazine for developing small, inexpensive, nanostructured chips that can effectively identify unknown liquids. Their winning technology, called W-Ink (Watermark Ink), could one day be used in a broad range of industrial and consumer applications such as testing ethanol levels in gasoline or detecting toxins in a chemical spill. The annual awards ceremony, held in Orlando, Fla., honored the 100 most technologically significant products of the previous year and their inventors. Since their inception in 1963, the awards have been a benchmark of excellence for diverse industry sectors. Past winners include game-changing technologies such as the flashcube (1965), the automated teller machine (1973), the fax machine (1975), the liquid crystal display (1980), the Nicoderm anti-smoking patch (1992), the Taxol anticancer drug (1993), and HDTV (1998). 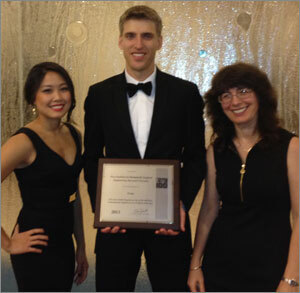 Natalie Koay, Ian Burgess, and Joanna Aizenberg accepted the R&D 100 award at the Awards Banquet in Orlando, Florida. “I am thrilled to see that Joanna Aizenberg and her team are receiving an R&D 100 Award for the second year in a row,” said Wyss Institute Founding Director Donald Ingber, M.D., Ph.D. “It’s another tremendous example of the creativity our faculty and staff, and how leveraging insights from nature can lead to revolutionary new technologies products.” Ingber is also a professor of bioengineering at SEAS, and Judah Folkman Professor of Vascular Biology at Harvard Medical School and Boston Children’s Hospital. In 2012, Aizenberg’s research group was recognized for their invention of an extremely low-friction material called SLIPS, for “slippery, liquid-infused porous surfaces.” Inspired by the pitcher plant, SLIPS resists liquid, ice, and dirt and could be incorporated into a wide range of products, from medical devices to refrigerators. This year’s winning technology, W-Ink, was also inspired by nature and the iridescent light effects of inverse opals that are found in butterfly wings and oyster shells. The technology was first described in the December 20, 2011 issue of the Journal of the American Chemical Society. Joanna Aizenberg, a Wyss Institute Core Faculty member and the Amy Smith Berylson Professor of Materials Science at SEAS, led the W-Ink development. She accepted the R&D 100 award with Wyss Institute Technology Development Fellow Ian Burgess, who earned his Ph.D. at SEAS in 2012 and Wyss Institute Research Assistant Natalie Koay. The combined system of inverse opal structures and patterned liquid-phobic coatings permits selective liquid penetration to reveal specific patterns when wet with different liquids. W-Ink consists of an iridescent surface coating that reveals specific color patterns when exposed to different liquids. It is low-cost and power-free and can be widely used to identify any type of liquid, making it a fast and convenient colorimetric sensor. “Our W-Ink technology greatly expands upon the concept of low-cost, simple visual colorimetric indicators, such as pH paper or pregnancy tests, that have enjoyed wide commercial success,” says Joanna Aizenberg. “We can detect any liquid through cleverly designed, chemically encoded opals that reveal easy-to-recognize, macroscopically distinct structural color patterns upon liquid wicking,” adds Ian Burgess.